"I decided to become a teacher to fit with my changing lifestyle"
The Master of Teaching is a pre-service teaching degree that will give you the skills and knowledge to teach in a primary or secondary school setting. The degree is designed to build upon tertiary qualifications and experience, enabling students to complete a teaching qualification in as little as 2 years. This course is accredited through the Tasmanian Teachers Registration Board, and is recognised in all Australian states and territories. Master of Teaching students can specialise in primary or secondary teaching. The secondary teaching specialisation requires students to choose two curriculum teaching areas, which are determined by the discipline(s) undertaken in the student’s undergraduate degree. You will be required to undertake a number of Professional Experience placements totalling 60 days. This will give you the opportunity to apply the theoretical and practical skills that you have learnt in a safe and supportive environment. 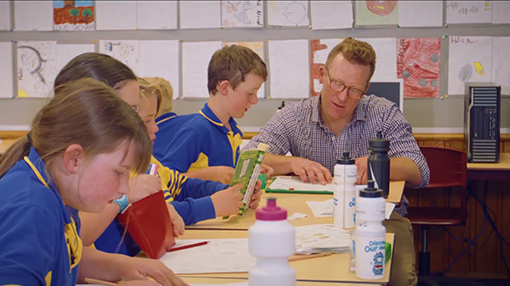 The Master of Teaching is available on-campus in Hobart and fully online- by distance. Not sure if you want to study online or on-campus? We offer flexible study options that allow you to choose how and where you study, depending on your needs. "The Master of Teaching allowed me to get straight into teaching. UTAS offered a really flexible program, it's been great." 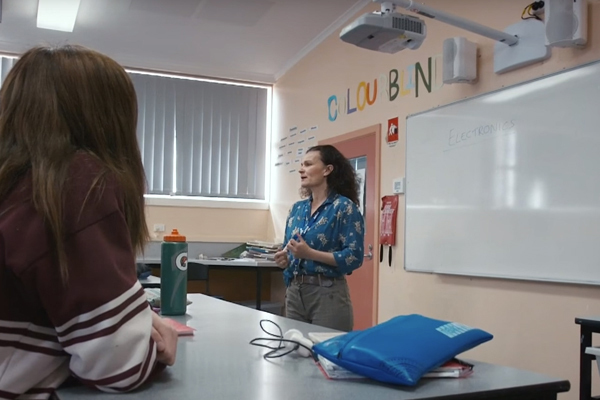 Students who undertake the Master of Teaching pre-service teacher education course will graduate with a professional qualification and preparation that meets national expectations and standards and makes them favoured for recruitment in systems throughout Tasmania and Australia. Through experiencing an internationalised curriculum our students will graduate with a global perspective and an enhanced capacity to teach overseas and experience the world whilst working. The program is informed by core theoretical knowledge, evidence-based practice and underpinned by a strong theory-practice nexus enacted in collaboration with appropriate employing authorities. An integral part of your learning in the Master of Teaching are classroom placements - putting into active practice the theory and knowledge you have been studying throughout your degree. As a student you will participate in a minimum of 60 days (12 weeks) of full-time Professional Experience. Placements are usually scheduled as continuous ‘blocks’ of time ranging from 5 to 30 days, and occur in a variety of learning environments. Placements are designed to enable our students to become familiar with a variety of Primary and Secondary learners and learning environments. Your placements will involve active observation, participation and engagement in teaching and learning roles and activities. For Master of Teaching pre-service teachers, placements focus on subject specialisation in a Primary or Secondary context. The Faculty of Education has a number of exchange partnerships with Universities whose curriculum and teaching our closely aligned with our own. A full list is available on the Student Exchange – Outgoing site. Find out more about the University’s Exchange Programs at Student Mobility. Graduates of Master of Teaching are deemed to be qualified to teach in public and private sector schools in all states and territories of Australia by the Australian Institute for Teaching and School Leadership. Our graduates work with students from Prep to Grade 6 (Primary specialisation) or Grade 7 to 12 (Secondary Specialisation), throughout Australia and overseas. The Masters of Teaching course is a professionally accredited Initial Teacher Education program approved by the Teachers Registration Board Tasmania. Further information about professional experience units and placements can be found here. The minimum entry requirements, for all students, is the completion of a Bachelor’s degree in a non-education discipline at an approved tertiary education institute. Key Learning Areas - The Key Learning Areas are: English; Mathematics; Science and Technology; Human Society and its Environment; Creative and Practical Arts; Personal Development, Health and Physical Education, and Languages other than English. The first teaching specialisation requires at least three years of degree level study leading to a completed bachelor degree, including, at least, two units at third year (advanced) level or above. The second teaching specialisation requires at least two years of degree level study, including, at least, two units at second year (Intermediate) level or above. Curriculum areas: These entry requirements relate to the following secondary curriculum areas all of which can be studied as either a first or second teaching specialisation: English; Mathematics; Science; SOSE; LOTE; Arts (Visual Art; Drama; Music; Media; Arts). Not sure how your major and curriculum areas match up? Contact us to discuss your options. More information about admission requirements can be find on the Admissions web page. In addition to the entry requirements listed above, international students who are nationals of and currently residing in a country where English is NOT the official language, evidence of an IELTS or TOEFL test must be provided. The Master of Teaching requires an (IELTS) average of 7.5 with no band lower than 7.0 and Listening and Speaking at 8.0. More information is available at the international future student’s website. This statement is submitted through the Non-Academic Capability Assessment Tool (NACAT) after you have completed your application and is used in conjunction with your ATAR score (or equivalent alternative entry.) All applicants must satisfactorily complete the NACAT before they will be provided with an offer into the course. Prior to undertaking their final Professional Experience placement, Master of Teaching students are required to complete the Literacy and Numeracy Test for Initial Teaching Education (LANTITE). Please contact us to discuss your credit options, and how applying for credit can fast-track your study and career in Education. Graduates of the Master of Teaching degree can advance their Education knowledge with specialised study through either a Postgraduate Coursework or a Research Higher Degree pathway. Filter the Course list on the Education and Teaching study theme page by Postgraduate or Higher Degrees by research to view the courses currently available. Students wishing to exit the Master of Teaching degree after one year can receive a Graduate Diploma of Education Studies qualification. Both Master of Teaching degrees are offered at Hobart campus, full time or part time, and by distance/on-line. The Graduate Diploma of Education Studies is not a professional teaching qualification. There is a large range of scholarships, bursaries and fee discounts available for international students studying at the University of Tasmania. For more information on these, visit the Tasmanian International Scholarships website.